Here's an excellent retrospective sampler of the first decade of Hal McGee's HalTapes lable, most of which includes his own home recording experiments and collaborations, covering the years 1981-1991. 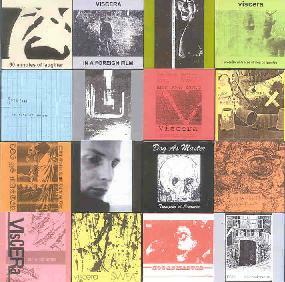 Hal has organized the sampler as a collage collection of 1+ minute bits from 58 tapes that he has reissued on CDR. Inside the liner notes we get a brief history and we also get a gallery of tape covers, including several of Hal's many collaborators from over the years. It's fun to listen to all these excerpts strung together... everything from the earliest Viscera recordings, to Dog As Master, Bwana Dog, collaborations with Chris "Mental Anguish" Phinney, Carl "Nomuzic" Howard, Dave Prescott, and various compilations featuring artists such as Merzbow, F/i, Lord Litter, Fred Lonberg-Holm, and much more. It's a can't-go-wrong taste of Hal's enormous catalog of work, as a well as an enjoyable collage styled document of one corner of the early years of D.I.Y. hometaping and sound experiments. For more a detailed history of Hal McGee CLICK HERE to read the interview we conducted with him in AI #19.